The family of a San Francisco man who disappeared earlier this month hasn't given up hope that they'll find him, saying that his cell phone still appears to be active. The Richmond District Blog reports that 26-year-old Sunset resident Adam Li was last seen on September 15, on 45th Avenue between Fulton and Cabrillo Streets. Li, who reportedly suffers from bipolar disorder and depression, has disappeared before, but this is the longest he's been missing, his brother Aaron says. "The police pinged Adam’s cell phone on Tuesday night," TRDB reports, "and received a signal location around 42nd Avenue and Clement Street." "But when police arrived at the location, they did not see anyone resembling Adam, and his cell phone was turned off shortly after." He's described as a 5' 7" Chinese male with a slim build, weighing in at about 140 pounds. He has black hair and brown eyes, his family says. According to a flier being passed out by the Li family, Adam is "a very timid person and can be unpredictable," and his brother says that he has "poor social skills and may get spooked and run if confronted." Therefore, if you do spot him you're urged to instead contact 911 (say you're reporting a sighting of missing person Adam Li), or call Aaron Li (415-867-9829), Alex Li (415-939-8229), or Mrs. Li (415-806-6889). 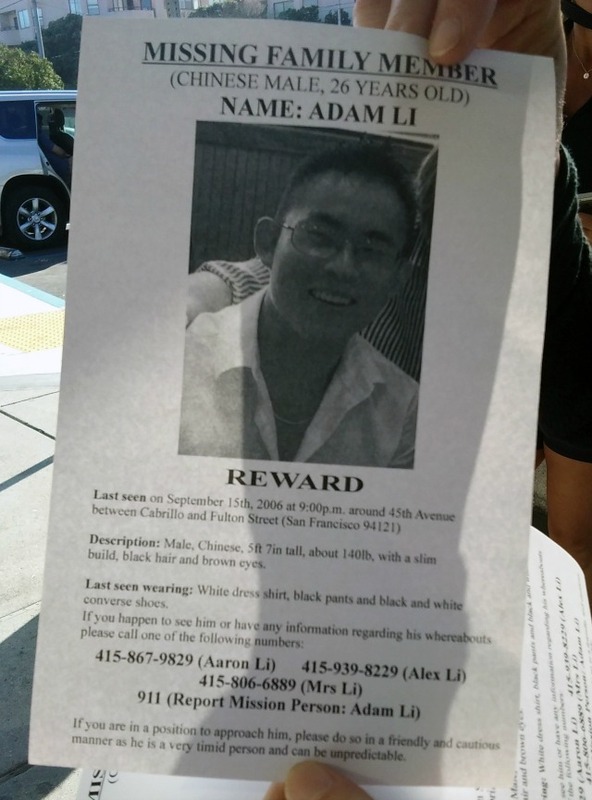 Photo if the flier seeking Adam Li: Richmond District Blog, used with permission.